Take just a few minutes every month to optimize your dishwasher’s performance. 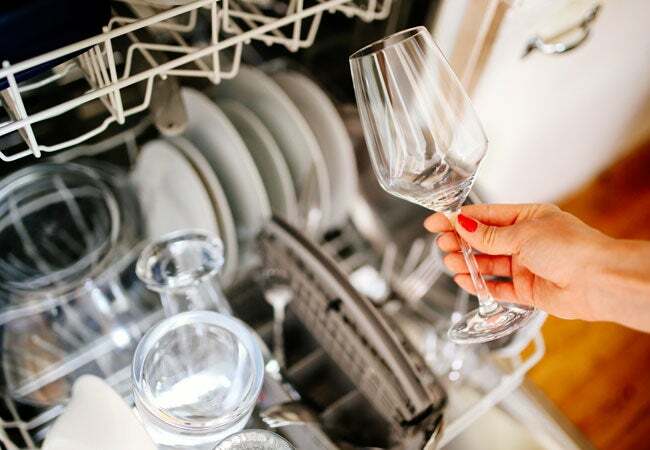 A well-maintained dishwasher filter can mean the difference between sparkling clean tableware and items marred by unsightly, unsanitary stuck-on food. It’s the filter’s purpose to prevent bits of food from recirculating onto plates, pans, silverware, and the like after the water and detergent have washed them away. But to do its job, this hardworking aspect of the machine must be free of buildup. There are two kinds of dishwasher filter assemblies: self-cleaning and manual. Dishwashers with self-cleaning filters (also known as “hard food disposers”) rely on an integrated grinder to pulverize food like a garbage disposal, which is then washed away through the drain. These filters are referred to as “self-cleaning” because there is no routine buildup for the owner to manage. The downside to this convenience is that these dishwashers tend to be much louder than those with manual filters. Manual filters require cleaning at least once per month, if not more, depending on usage and pre-rinse habits. You should also be alert to visual and olfactory cues—like dishes that feel gritty, stray bits of food left behind, or unpleasant odors—to remind you to clean the filter. To determine the type of filter you have, consult your owner’s manual or look in the bottom of the dishwasher, under the rotating arm. If you see a removable cylindrical piece, likely with arrows indicating which direction to twist, it’s a manual filter. Fortunately, a manual filter is easy to remove and clean in mere minutes. Just have dish soap and a soft scrubbing tool, like a sponge or an old toothbrush, on hand before getting started, and follow these detailed steps for how to clean a dishwasher filter. Remove the bottom rack of the dishwasher and locate the filter—a cylindrical tube that twist-locks into place—on the floor of the unit. Some models also have a secondary lower, flat filter, found below the cylindrical one. This filter has a hole in the middle through which the cylindrical one is installed, and it does not lock in place. Both need to be removed for cleaning. Remove the upper, cylindrical filter first by twisting to unlock it. In most models, the filter twists counter-clockwise, but there should be arrows indicating the correct direction. Once unlocked, pull up gently to remove the filter. Then simply lift out the lower filter if there is one. Hand-wash the filter(s) in warm, soapy water and rinse thoroughly under running water. For stubborn pieces of food, scrub the filter very gently with a sponge or old toothbrush. Next, examine the area where the filters are installed for errant food particles, using a damp towel to wipe the area clean if necessary. Place the flat filter back in place, if there is one, then insert the cylindrical filter next, locking it securely back in place. That’s it! With as quick and painless as the process was to clean the dishwasher filter, you may still have time to spare to clean the hard-working appliance in full—or, at the very least, add a reminder in your calendar to schedule a cleaning one to two months out (and set it to repeat). Meanwhile, your appliance is ready for its next load of dirty dishes, so fill ‘er up.